Many religious traditions emphasize the importance of forgiveness, and the avoidance of revenge. Regardless of conventional wisdom, it is interesting to understand why some people are less likely to seek revenge than others. Klemecki, Sander, and Vuilleumier from the University of Geneva investigated this question by observing the regions of the brain responsible for the suppression of revenge, in addition to distinguishing emotional anger from the mechanisms of retaliatory response decision-making. In this study, participants engaged in a game known as the Inequality Game, a decision-making game involving the transaction of financial currency. The goal of this this game is to make as much profit as possible. An fMRI machine recorded participants’ brain activity as they played the Inequality Game. Study participants played with two individuals who had been placed by the experimenter, one of whom acted rudely and ruined the participants’ chances in winning. The participants then had the chance to punish the player by seeking revenge with a retaliatory response (Klimecki et. al, 2018). Klimecki et. al were able to identify which brain regions were responsible for an anger response when participants saw an image of the rude player. They noted that the amygdala, a region of the brain involved in the processing of fear and awards/punishments, was particularly active, in addition to the superior temporal sulcus (STS), an area responsible for mentalizing, and the fusiform gyrus, an area responsible for facial recognition. In identifying the revenge-suppressing mechanisms of the brain, they noted that two regions of the brain, the dorsal lateral prefrontal cortex (DLPFC) and the anterior cingulate cortex (ACC), were active for individuals who chose not to seek revenge. The DLPFC and ACC are important in resolving conflict and regulation emotions, which are regions typically impaired in anti-social populations (Klimecki et. al, 2018). The results of this study suggests that the brain is equipped to keep revenge-seeking behaviors in check. It also shows how revenge-suppression capabilities vary between individuals. From a moralistic perspective, it would seem that revenge-seeking would decrease in a given population due to undesirable outcomes, yet according to previous research, revenge-seeking behaviors survived because they teach the aggressor to not attack the victim in the future, making them evolutionarily ‘fit’ (McCullough, Kurzban, & Tabak, 2013). Yet forgiveness is also ‘fit’, as it aids with reparation of important relationships between two conflicting parties, resulting in mutual benefits (McCullough et. al, 2013). As indicated by the results of this study, the DLPFC and ACC must have developed evolutionarily over time to provide evolutionary fitness according to the forgiveness model; yet the existence of both revenge-seeking and forgiveness-seeking individuals shows that both systems are important in social interactions. Klimeck et. al’s study thus unveils the specific biological mechanisms responsible for the variance of revenge-seeking behaviors within the general population: the DLPFC and ACC. 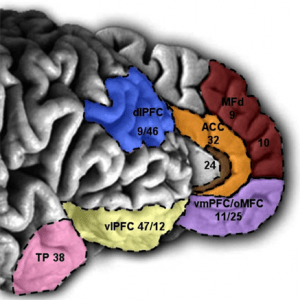 Future research into the evolutionary history of the DLPFC and ACC, as well as treatment procedures in these regions for social psychopathologies, would be interesting topics to explore. McCullough, M.E., Kurzban, R., & Tabak, B.A. (2013). Cognitive systems for revenge and forgiveness. Behavioral and Brain Sciences, 36(1), 1-15.